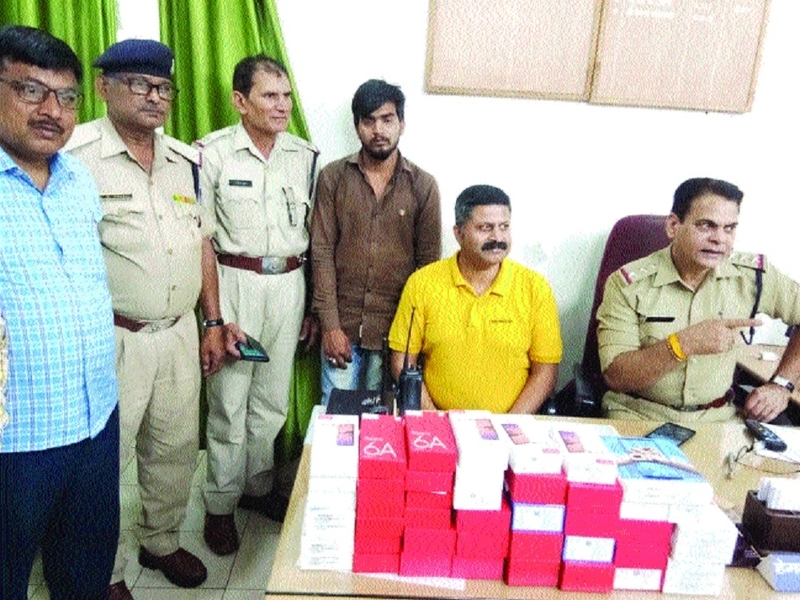 During intensive checking drive in the wake of Lok Sabha elections, the Government Railway Police (GRP) Bhopal arrested a miscreant and recovered 85 mobile phones worth Rs 8.16 lakh from his possession on Saturday. The miscreant was nabbed after his luggage was checked and found that 85 mobile phones were in his baggage and when he was asked regarding documents of the mobile phones, he failed to provide any document. Nabbed accused was identified as Shaikh Shoaib, 25, son of Shaikh Raju of Shastri Nagar in Hoshangabad district and was nabbed while he was waiting to board train to Itarsi. SHO of GRP Bhopal Hemant Shrivastava said that, after the person was nabbed with the mobile phones, in-charge of flying squad -3 JM Suresh Singh along with the team members JE BMC Umashankar Sharma and ASI Umrao Singh reached the spot and started investigation. A total of 85 mobile phones were recovered from Shoaib’s possession. The mobile phones are worth Rs 8,16,761. The SFT team was informed soon after the man was nabbed with the mobile phones. Police said that the mobile phones are stolen or the mobile phones were being transported illegally would be investigated. The Itarsi police have been contacted and details of the accused would be searched in the further investigation. The special vigil team of GRP Bhopal has been working to check illegally transported cash and other valuables, which could impact during the Lok Sabha elections and till date, massive cash over Rs 4.4 crore has been seized along with other valuables.